If during your B Arch you felt that this was not the correct course choice and you do not want to be in this field then you should explore other options. Here again before making another incorrect choice go for professional help, visit a Career Counsellor before zeroing down on any course. If you were very interested and enjoyed your course and also the internship then you should try and get yourself a job after completing B Arch so that you gain relevant experience. After this experience may be your pocket will not be very heavy ( since salaries are not very high) but you will be sure about which area within architecture interests you most. Whether it is sustainable buildings or landscape or urban planning or others. Also if you are serious on exploring higher education options then FYI top colleges offering M Arch and MBA give preference to students having work experience. If you have good communications skills and business acumen then you can go for MBA or Construction Management course after B Arch. Here again the B Schools will prefer you as you are professionally qualified and have work experience. If you think that the designer in you is not happy within this field then you can consider M Design after B Arch and plenty of options are available to you like universal design, toy design, product design, communication design etc. 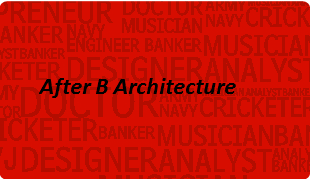 If you think that one course may not interest you then you can go for a dual degree in MBA and M Arch after B Arch. Many reputed universities in USA offer these courses like Arizona State University, University of Colorado, State University of New York Buffalo, University of Kansas, and University of Michigan etc. And many of them offer scholarships as well. If none of the above interests you then some traditional careers may interest you. Like you can go for higher education and teach in an Architecture college. You can go for jobs in the government sector like Urban Housing boards and PSU banks also hire B Arch graduates. You can be a civil servant after B Arch. So you can see that plenty of options are available to you and if you are still confused you can get in touch with us and get personalized counseling to help you make the right career decision.